Hello and welcome to Eva Santiago310! I am a published author , teacher, translator and editor. As a private tutor, I teach ESL (English as a second language) and Spanish. I’m also a professional translator, I interpret for the court as well as business seminars,personal development seminars and a host of other settings where my translator skills are called upon. I have helped several authors edit their manuscripts and get them ready for publishing. As you can see, my business keeps me quite busy and I love what I do because I know my services are helping bridge a gap between the American and Latino cultures. I adore my clients and I am always eager to help them succeed! I have many passions and my top three are education,communication and writing. I believe that when you do what you love for a living, it doesn’t seem like work at all. I did learn from my father that he was an affectionate and tender man because I still feel the warmth of his love. Even though it has already been a lifetime of not having him in my life, I know that he loved me. When I was younger I used to see him as a god who could do no wrong. Then I grew up and I had to accept the reality that my father was a sinner just like me. I just wanted to share some info about my writing journey with my readers. I graduated from high school in San Antonio Tx in 1987; John Marshall High School is my alma mater. I attended college in Atlanta Georgia; first I went to A.I.A and then I graduated from The American College for the Applied Arts with a B.A. in Fashion and Business. 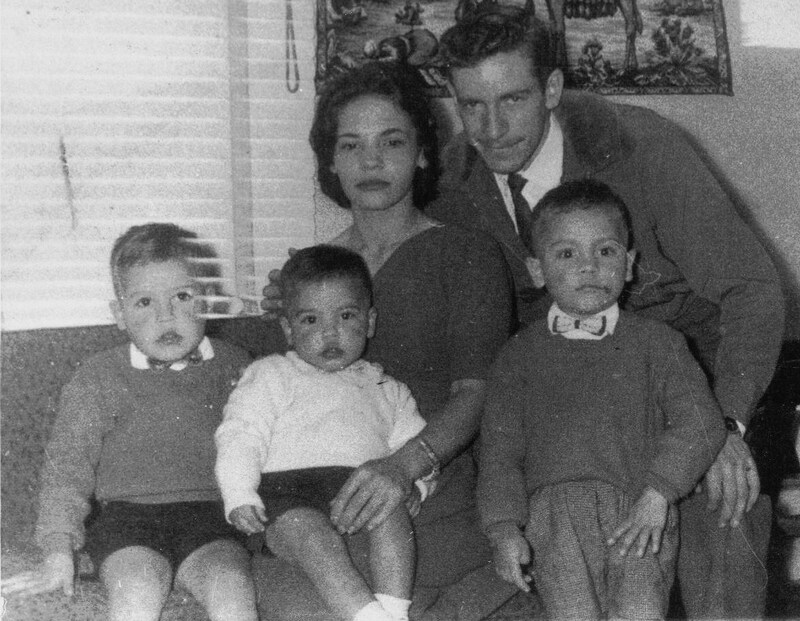 I came to the US from Colombia when I was 6 and I had to learn English. Once I learned to communicate in English I started my life long love affair with words,sentences,paragraphs,pen and paper. As a young child I had no one to confide in so I discovered that writing was a powerful tool for me;it helped me process my feelings and once I wrote things down I felt better. Writing also became my trusted friend because I could say anything in my journals and never be corrected or reprimanded by my superiors. I loved reading as a child also and I would steal away to my bedroom; where I would travel to far away places through the books I was reading. When I was bored in my classes at school, I would read a book and tune out the teacher. Surprisingly I was able to keep all of my marks up. In the 6th grade I had a wonderful teacher who encouraged me to write. As a class assignment she had us write poems and without telling any of us,she entered some of them in a local library poetry contest. I was amazed when one day she gave me a note that told me to go to the local library to receive a certificate for the poem I had written. I never forgot that feeling and I thank this teacher for having pointed out my gift to me. Once I reached high school,in the 11th grade my English teacher from the year before approached me and asked me to submit a poem for the annual school anthology. Yet again I was shocked that she would come to me. So I wrote a poem about love and a few months later I saw my work published and I beamed inside. During my senior year I joined the yearbook staff for my school and I loved writing articles for the different sections of the book. When I received my own copy at the end of the year, I was so happy to have participated in putting that book together for my last year of school. When I went to college I took a course in Fashion Journalism which I thoroughly enjoyed. I attended a couple of fashion shows at The Apparel Mart in Atlanta and I was assigned to do the write ups for both shows. I let my imagination fly as I took in all of the designs that paraded in front of me. The more I wrote,I began to see how much I love it. During those years family,friends and acquaintances would encourage me by telling me I was a great writer. I dismissed what they said because I didn’t think much of my gifting since it has always come easy to me. When I met my husband,he would always tell me I had a gift and I tuned it out too. I worked at a history museum during my last year of college and I remained employed there after graduation. 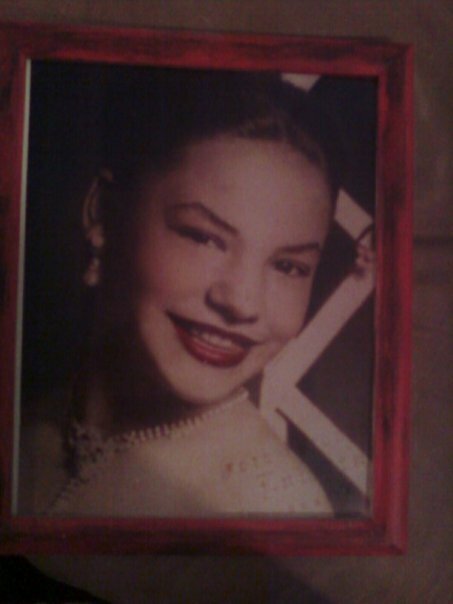 Atlanta Heritage Row was a great place for me because I was able to use my artistic capabilities at work. I was the manager of the gift store and I also was a bilingual tour guide. During those years I met and made friends with some truly wonderful people! My boss, Lillian Gantsoudes,the museum director encouraged me so much. She believed in me to the point where she asked me to design an exhibit using fresh flowers, that would represent our museum at the annual Atlanta Flower Show. I went for it and doing so I discovered my love for flowers! Several years after I graduated from college ,with honors, I decided to start a family and that’s when I turned to journaling like never before. I have a full size file cabinet of journals from those years and I still add to my collection. Friends and family began telling me that I should write a book and I actually began to pay attention to what they were telling me. I set out to write a book of poetry as my first endeavor;I figured since I had been writing poems for most of my life,then that was a good place to start. Due to my lack of computer skills back then,I put the project on the back burner because I lost my work on the computer several times. I saw that as a sign to step back for a while. I also had 4 children under the age of 5 at that time so I didn’t think it was the time to work on a book. In October of 2007 I went to a meeting where a great man of God named Lance Wallnau spoke to me. In just a few seconds he spoke to me words that turned my life around forever; just a few words of encouragement from this man were all I needed to begin my book. I came home that night and I remember making a bold declaration to myself and in front of my family; I would begin the book I was meant to write and off I went! 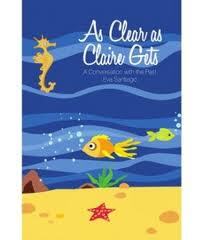 I will sign off for now and later I will continue to share more on the journey I took as I worked on As Clear as Claire Gets, A Conversation with the Past. Very interesting. I enjoyed reading this blog,love the graphics. Thank you so much Liz! Please visit often and spread the word about me as I will do likewise for yours. BTW, I can’t find your blog. Thanks for your kind comments on my blog. Also, I am happy to see that you support homeschooling. Coincidentally, my wife, Valerie, is about to put out her own blog about home education. We have been have been homeschooling for over 10 years. You write good stuff. I enjoy you; very refreshing! “Eva,”? The name does not sound familiar, however I’m assuming that this is maybe a middle name for you Clara? I really learned a lot about you by reading this blog, very interesting lady you are with an awesome gift to write and to be able to teach your children at home. I truly applaud you for that and would love to speak with you more on this subject. So I’m excited for you about your book and please keep me informed on how it’s developing. By the way, I simply adore you children. As a youth leader, it’s a blessing to see our youth with the desire to see God move as they pray humbly yet boldly before his throne! Well, God bless you and I’m not use to how blogs work, but if I keep getting posts to remind me that I have a new one, then I’ll know to read it. Love you sister. So nice to meet another homeschooling mom! Even though our homeschool years are finished (our daughter is now a senior in college) I still consider myself a passionate homeschooler. It was the best decision we ever made–for our daughter and for us as a family. Thank you for subscribing to my blog. Going to have to do some reading on yours and catch up! Eva, I feel like I’ve found a soul sistah within ten minutes of finding your blog. You commented on mine about our adoption of our Colombian princess. I am also an author… AND I homeschool my four kids. We are on year 11. I’m supposed to be packing to leave in the morning for a homeschool conference… NOW you’ve got me all distracted. I’ll be back! Thank you Lamar, I enjoy writing very much and I hope you visit often! hello i came to youre site, and I have read some great articles on it. It’s all about the game Gratis gokkasten let’s PLAY!!! Thanks for your kind comments on my blog. I’m afraid I only take pictures and don’t write an awful lot. After reading your about page, I will be returning often. Thank you. I simply want to say I’m very new to blogging and truly enjoyed this web site. Almost certainly I’m going to bookmark your blog post . You definitely have remarkable writings. Kudos for sharing with us your web site. I simply want to say I am just beginner to weblog and honestly savored you’re blog. Probably I’m planning to bookmark your site . You definitely come with very good posts. Appreciate it for sharing with us your web-site. Can I just simply say what relief to seek out someone who basically knows what exactly theyre dealing with on the internet. You certainly know how to get an issue to help light and produce it critical. More people must read this plus understand this aspect of the account. I cannot believe youre not more popular when you definitely provide the gift. I’m so happy to read this. This is the kind of info that needs to be given and not the random misinformation that is at the other blogs. Appreciate your sharing this best doc. This could be the appropriate weblog for everyone who hopes to discover this topic. You realize significantly its virtually difficult to argue together with you (not that When i would want…HaHa). You certainly put a different spin on the topic thats been discussing for several years. Excellent stuff, just fantastic! Top notch piece of writing. Keep up the superior performance. Hey There. I found your weblog the usage of msn. This is a very well written article. I will make sure to bookmark it and return to read more of your useful info. Thanks for the post. I’ll certainly comeback. Just how long does it take before I will be viewed as a pro? Wow and WOW, Eva–great stuff! I so agree that Humor is essential! (As is Faith in God!) Maybe you can help me with my Spanish, which is muy malo! Catch you later–God bless! Thanks for sharing superb informations. Your web-site is very cool. I am impressed by the details that you have on this site. It reveals how nicely you understand this subject. Bookmarked this website page, will come back for more articles. You, my friend, ROCK! I found just the information I already searched everywhere and simply could not come across. What an ideal web site. I just want to tell you that I am just very new to weblog and definitely enjoyed this web blog. Most likely I’m likely to bookmark your blog post . You surely come with good well written articles. Cheers for sharing with us your blog. Excellent post. I was checking continuously this blog and I am impressed! Extremely useful information specifically the last part 🙂 I care for such information much. I was seeking this particular info for a very long time. Thank you and good luck. What a great write-up! No idea how you were able to write this post..it’d take me days. Well worth it though, I’d assume. Have you considered selling advertising space on your website? This is my fifth time to your site, I love it every time! Simply desire to say your article is as surprising. The clearness in your post is just spectacular and i could assume you are an expert on this subject. Fine with your permission allow me to grab your feed to keep up to date with forthcoming post. Thanks a million and please keep up the enjoyable work. Hello there, just turned into alert to your blog thru Google, and located that it is truly informative. I am gonna watch out for brussels. I’ll be grateful in case you proceed this in future. Numerous other people can be benefited from your writing. Cheers! I’ve gone ahead and bookmarked https://evasantiago.wordpress.com/about at Digg.com so my friends can see it too.Â I simply used About | Eva Santiago as the entry title in my Digg.com bookmark, as I figured if it is good enough for you to title your blog post that, then you probably would like to see it bookmarked the same way. I’d have to check with people here. Which isn’t something I do! I like reading an article that will make people think. In addition, thanks for allowing for me to help comment! Hey! I simply would like to give a huge thumbs up for the great data you might have here on this post. I will be coming back to your blog for extra soon. You could certainly see your enthusiasm within the work you write. The world hopes for even more passionate writers like you who aren’t afraid to mention how they believe. Always follow your heart. “In America, through pressure of conformity, there is freedom of choice, but nothing to choose from.” by Peter Ustinov. Hello there, You’ve performed an excellent job. I will certainly digg it and individually recommend to my friends. I’m sure they will be benefited from this site. Can I simply say what a relief to search out someone who truly knows what theyre talking about on the internet. You positively know easy methods to convey an issue to gentle and make it important. More individuals must learn this and understand this side of the story. I cant imagine youre no more well-liked because you positively have the gift. I was just looking for this info for a while. After six hours of continuous Googleing, finally I got it in your website. I wonder what is the lack of Google strategy that don’t rank this type of informative websites in top of the list. Normally the top sites are full of garbage. Sure, only as long as you give me the credit and show that it came from my blog because all of my content is copyrighted. Thanks! After scrolling down for about two minutes to come to this little comment square, I get my turn!! Love your story. I have no education or writing experience but have been led to write and it has been a part of my healing unexpected. Love reading your story and thoughts!! I believe other website owners should take this internet site as an model, very clean and good user friendly layout. Ello, thanks for the follow. I was just wonder, where did you find my blog? I am not complaining, just wondering. Well I just stumbled on it as I read other blogs. I’d be more than happy to unfollow you if you wish . No, no, I am glad you found it and liked enough to follow, I was just wondering. Wow, this is fun to see. Maybe you have considered submitting articles to magazines? Thanks for checking out my blog, it gave me the opportunity to find yours! Terrific stuff, keep it up! It is an honor to have you follow my blog. What a wonderful writer you are…what an interesting life you live….I am glad you found me (however that was) cause now I’ve found you and your very interesting site. I look forward to your writing. My best to you and yours! Thank you Tom for stopping by. I appreciate every word you just wrote on this comment. People like you, keep me plugging along and believing what I do touches people even if in a little way. Thanks for checking out my site and for the follow. I enjoyed reading your blog and look forward to reading your blogs! Thats great that you have had so many people to encourage you to write! I love to read and blog though my love for reading started 6 years ago at 30. I before that I hated to read probably since high school. I became a Christian at 30 and The Bible was the book to get me reading again! Next to that was the Harry Potter series lol! I’ve only been blogging for a few months and do enjoy it. I find it hard sometimes to blog everyday and posting my favorite Bible verses at least gives me something to share when I have nothing to blog about! Its great to meet you thanks again! Thanks for sharing your life, and inspiration with us! Thanks for stopping in and commenting, it means a lot!! You have a quite a variety of engaging topics. I look forward to coming back. Thank you for following. Thank you! I take your nice words to heart! YOU are very welcome. 🙂 Happy Tuesday. Wow! Thank you for following. I just started my blog! I’ve seen your book before and I did read it. It was well done! It’s nice to know you’re following. Hi Eva. Thanks for visiting thefirstgates and liking a post. Your own blog is certainly rich in content! I love your story. You are truly a gifted writer, keep at it. Wow, amazing blog layout! How long have you been blogging for? you make blogging look easy. The overall look of your web site is fantastic, as well as the content!. Thanks For Your article about About Eva’s Passions | Eva Santiago . I was so excited to read that you homeschool! I was homeschooled myself and my husband was also homeschooled. We plan to homeschool our own children until highschool (this was the point where our parents entered us into the public education system). We found that going to highschool was beneficial to us because it taught us how non-homeschooled people were taught, enabled us to build social relationships, and helped to prepare us for post-secondary school. Because we were homeschooled we knew how to teach ourselves from a book as well as how to follow direction from a teacher. This gives us an edge in post-secondary school where teachers don’t spoon-feed the information to the students. I can’t wait to see how you teach your children! Spot on with this write-up, I seriously believe this website needs a great deal more attention. I’ll probably be back again to see more, thanks for the info! Thanks for stopping by Tom! I really appreciate your comment! Have a great day and don’t forget to give my contest a try. 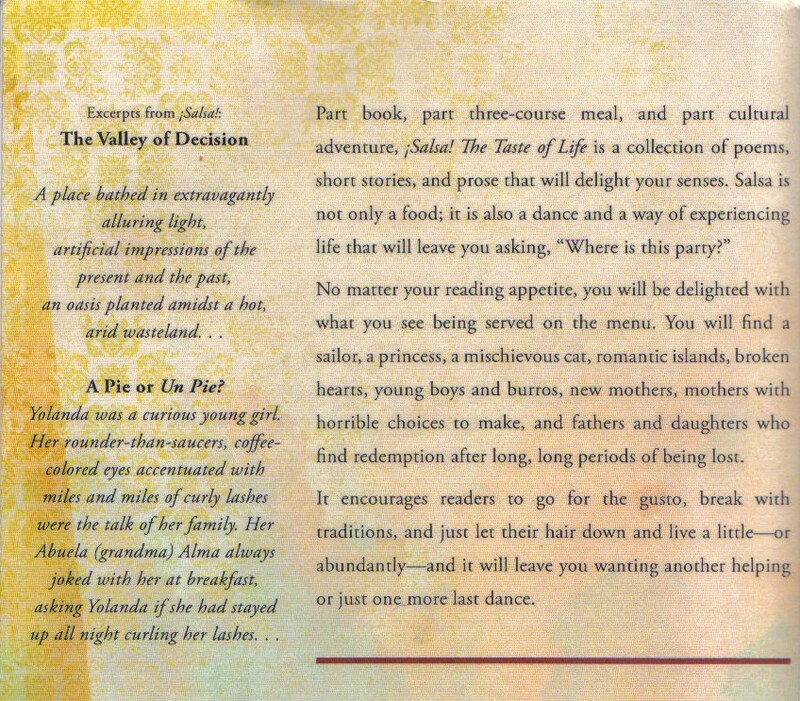 Be the first person to answer the question correctly and you could win a FREE copy of my new book, Salsa! The Taste of Life. Interesting reading your blog. Really interesting. It must be quite a challenge homeschooling. At what stage do you let them go out to formal schools? I can’t begin to mention the things I have enjoyed reading about from this page, but I’m interested enough to decide to follow your blog. Oh! And thanks for following mine. Well, I am not against homeschooling as such. But, how sure were you none of your kids would end up a doctor or lawyer? I know there are risks to letting the child mix with kids from other school, but life’s lessons are also learnt. Now, indeed some methods work well for some people, that still brings back the question of how sure you were you could apply this same principle to ALL of them? Maybe I should start with: Why exactly did you choose homeschooling? The beauty of home education is that the parents can tailor it to the needs of their children. Being the parent/teacher, you know your child like no one else. I knew early on that my home is filled with creative/artistic minds. Therefore I was able to tailor their education in that direction. I share my experiences as a homeschooler based on what I have lived and learned throughout this enriching and empowering journey. My main reason for choosing this way of life was because where I live, the schools rank among the worst in our country; I wanted my kids to have a better education than what this state offers in the public school system. Best of luck with your new book! I first started dancing to salsa at the “Gran Leon” a wonderful old club in Mexico City. Now I dance in the kitchen with my kids. I admire your choice to homeschool four! Thanks for following my blog. I will visit here again. Thanks for stopping by my blog. I love yours, so creative and filled with beauty. 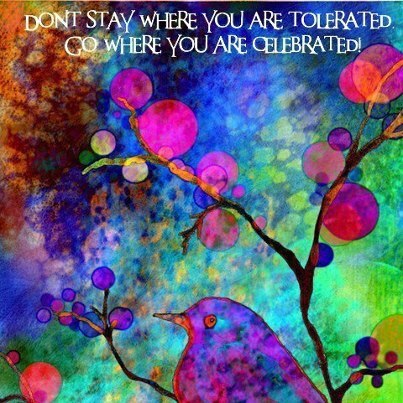 I ADORE the picture you have here of the bird saying go where you are celebrated. Is that your work? It touched my heart when I saw it, I want it! Yes…celebrated! (And *thank you* for the recent “like” at my blog:) Your website is wonderful and professional, full of life and color and song!!! Hi, I do think this is an excellent web site. I stumbledupon it 😉 I am going to come back yet again since i have book-marked it. Money and freedom is the best way to change, may you be rich and continue to guide others. Wow, awesome blog layout! How long have you been blogging for? you make blogging look easy. The overall look of your web site is fantastic, let alone the content!. Thanks For Your article about About Eva& . Hi Eva! Thank you for stopping by and subscribing to follow my blog! May God bless you through it! I’ve enjoyed reading yours as well! Quality posts is the important to attract the users to pay a visit the site, that’s what this site is providing. Wow, amazing blog layout! How long have you been blogging for? you make blogging look easy. The overall look of your website is wonderful, as well as the content!. Thanks For Your article about About Eva& . Have you ever thought about writing an e-book or guest authoring on other blogs? I have a blog based on the same subjects you discuss and would love to have you share some stories/information. I know my subscribers would enjoy your work. If you’re even remotely interested, feel free to shoot me an e mail. I simply want to say I am all new to blogging and actually enjoyed you’re website. Likely I’m likely to bookmark your site . You actually come with excellent articles. Cheers for sharing your blog site. Good post. I learn something new and challenging on sites I stumbleupon every day. It’s always helpful to read articles from other authors and practice a little something from their web sites. Hey there! I simply would like to offer you a huge thumbs up for your great information you’ve got here on this post. acquire actually enjoyed account your blog posts. Anyway I’ll be subscribing to your feeds and even I achievement you access consistently rapidly. Thanks for any other fantastic article. Where else may anyone get that kind of info in such a perfect manner of writing? 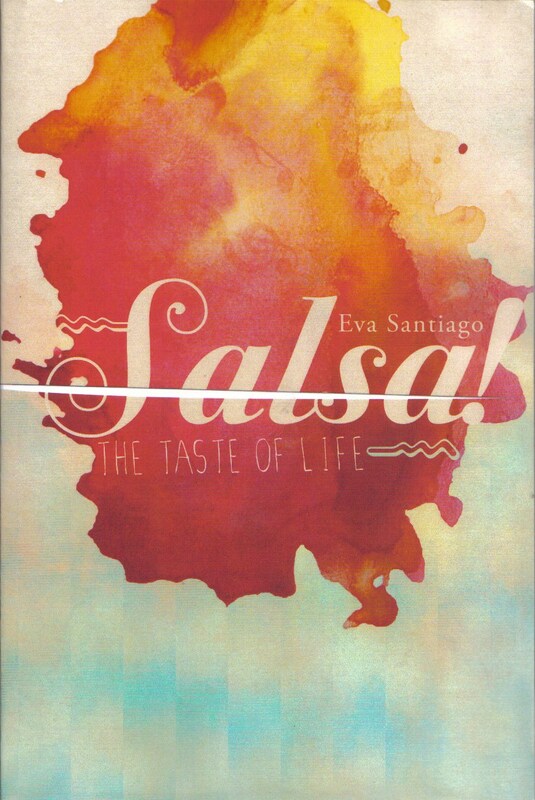 Hi Eva, Congratulations on Salsa, and thanks for following my blog. Thank yo so much and I appreciate your comment!! ultimate part 🙂 I deal with such information much. I was seeking this certain info for a very long time. After scrolling down for three days, I finally hit the Leave a Reply box! Whew! I think I sprained my finger! Thanks for visiting my online writing studio, Eva, and for choosing to follow my work. I am honored. Nice to meet you Eva. Thanks for stopping by and liking my post! I pay a quick visit every day a few sites and websites to read content, but this webpage offers feature based content.